‘Did I really read the words Victorian Rock Band’ , I hear you say. Yes, they did exist! One band in particular played a Command Performance for Queen Victoria, of which she wrote in her journal ‘A Rock Band played after dinner in our room. It was a curious thing’. Andy Aliffe was inspired to research and write about the subject after seeing a poster in an exhibition at London’s Guild Hall Library. Andy says ‘I did a double take when I saw advertising material for a Rock Band dated 1845.The vision of a Victorian Rock Band travelling around in a fleet of darkened windowed, ‘stretched’ horse drawn carriages, with an entourage of ‘groupies’ and ‘roadies’, trashing inns and smashing their instruments in the congenial atmosphere of a marbled, palm tree lined Temperance Concert Hall appealed to me, so further investigation was required’. What Andy discovered led him to make contact with Jamie Barnes, curator of Keswick Museum and Art Gallery. This establishment has perhaps the best examples of Rock Instruments in the country, dating from the late 1700’s to the mid 1800’s. The reason these musicians were called Rock Bands was quite simply that their instruments were literally made from ‘Rock’. 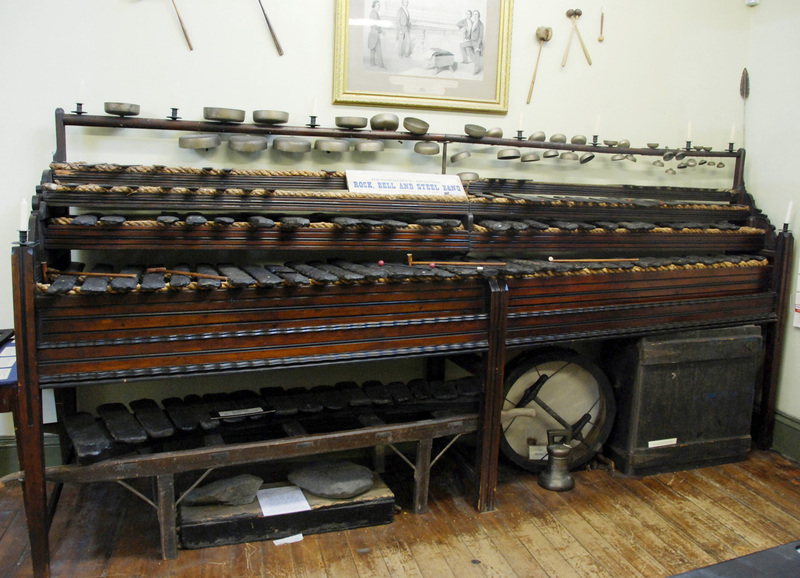 The most famous of the Keswick instruments is the ‘Richardson Rock Harmonicon’, made by Cumbrian stone mason Joseph Richardson. Starting in 1827, it took Joseph thirteen years to source, tune and construct his sixty piece set of local ‘hornsfel’ stones, to create a full chromatic scale. The ‘hornsfel’ seems curious to a very small area of the Skiddaw region of the Lake District, and so hence generations of ‘Rock Players’ have originated or quarried the material in that place. Over the years they have included groups such as The Bowes, The Harrison’s, Henderson-Tangye & Sons, The Abrahams, a multitude of circus performers, and the very popular ‘Till Family – Rock Band Concert Company’ who played a host of dates in the capital, toured the UK proveniences during the 1870’s and mid 80’s, and made ‘Brit Rock’ big in America in the late 1880’s. The Richardson Harmonicon required three players, and Joseph, himself a talented musician, enlisted his musically able sons as performers. Their repertoire included selections from the great composers, Handel, Beethoven and Mozart, with arrangements of waltzes, quadrilles, polkas, and gallops, the ‘Pop Music’ of the day. Reporting on a concert held in Liverpool in September 1842, a correspondent added ‘Some wild young fellows feel desperately inclined, under the exciting influence, to infringe upon the rules of formality, by clearing away benches and asking the young ladies to dance with them, which I’m sure, as far as the regularity of time and tune is concerned, might be easily accomplished; however the irregularity of time and place might shock the decorum of strait laced individuals’. The bands popularity and success led them to ‘top the bill’, headlining at Buckingham Palace in February 1848, in front of a large assembly of English and foreign nobility. Both Queen Victoria and Prince Albert requested encores of certain musical pieces. Following the triumph of the Royal Command Performance, a decision was made to add vocal selections to an already growing instrumental repertoire. With an established reputation, and with all the glamour and style of the age, the Richardson’s engaged the 24 year old vocalist Miss Julia Gould, for a series of national concert dates during 1848 and 1849. Julia thus became the first ever ‘lead singer’ with a Rock Band and established herself as the original ‘Rock Chick’! In an age of limited geographical mobility, the Richardson’s toured extensively throughout the United Kingdom and Ireland during the 1840’s to the 1860’s. With over a ton of equipment, their earlier ‘gigs’ were arrived at by carriage and horse drawn haulage, but at the height of their fame they were able to utilise a newly developed steam railway system. Pre-empting the legendary UK and US Rock Concerts of the 20th Century, by over a hundred years, the Richardson’s played both the Isle of Wight and Woodstock. In September 1850, they performed at Cowes Town Hall ‘to a numerous and genteel audience, who were highly pleased and appreciative with the concert’. And in April 1851 they gave a recital at the Town Hall in the rural Oxfordshire market town of Woodstock, noted in the local press as ‘The evening was received with enjoyment, gratification, and the astonishing performances, of which are now well known, were greeted with volumes of applause’. Like the Rock Bands of today, the group were quick to discover the promotional and marketing potential of selling ‘branded concert merchandise’ with the band name logo and illustration, printed on placards, sheet music and programmes. At a later date, with improved photographic and printing processes, lithographic reproductions of the instrument and players were also available for sale at venues; a ‘must have’ for their increasing fan base. More information and links can be found on the following web sites.